In Android Winter, X and Shortcut enter the badlands to figure out who is behind the recent attacks. 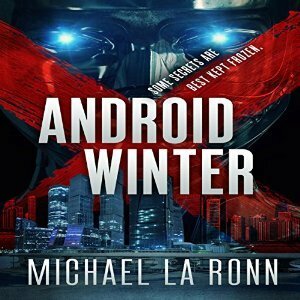 Narration in Android Winter was done by Erik Johnson who did all three Android X books. His narration was the story. He became the characters and that really made this series a breeze to listen to for me. I like it when I can tell that someone really worked hard to make the characters shine, and I think that Johnson does that here. This was an interesting one for me. I loved all three stories, but I liked them a little less each time. I think because I felt like I had to wait for what to me felt like a full story that was split into three parts. Granted the 4 hour audiobook times were great, I flew through them without looking back. But I think that if this was released as a full story it would have gotten a 4.5 maybe even a 5 out of me. With that being said, the conclusion to this story was really enjoyable. Action packed, and full of surprised. Michael La Ronn didn’t hold back as he wrote the finale of this series and even pulled the wool over my eyes a full times. Shortcut is back and not doing well throughout, but with no spoilers there’s not much I can write about him. X is forced to face off against people he never expected — in a place he never expected to be. The story flowed really well throughout this book and through the whole stories (I see that now that they are finished, a full audiobook of the entire series is now published too (which I would HIGHLY recommend). The series was incredibly fun, fast-paced and a lightning fast read/listen.